Liquid Deer Repellents are great for almost every type of plant, tall or short, large or small, potted or planted directly in the ground. Liquid products repel by both taste and smell. 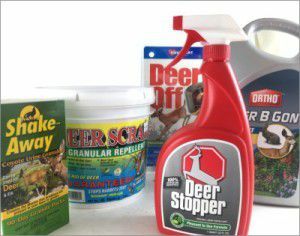 The odor of these products “covers up” the natural plant scent that deer are used to and trust. Treated plants no longer smell like a typical food source. If deer are stubborn enough and still want to sample a treated plant they will be turned off by the bad taste and will move on to another area. Liquid products are made of a variety of ingredients, but the most common ingredients are egg solids, garlic, cinnamon, mint, and/or capsicum. Some of our favorite liquid-based products are Liquid Fence, Deer Stopper, Bobbex, Deer Off and Repels All. Contrary to many beliefs, liquid deer repellents are rain resistant! As long as the liquid deer repellent has had a chance to dry completely before rainfall, it will not be rinsed off. The big thing to keep in mind here, is to follow the application instructions and to apply the liquid spray to new growth. Therefore, when plants are growing rapidly in the spring, you may need to spray new growth every few days to be sure that you are protected. Once growth slows in the late spring or summer, applications typically reduce to once a month with liquid spray-on products. Granular (Dry) deer repellent are easy to apply and will last longer than liquid deer repellents. On average, granular deer repellents will last about 30 days and are applied as a perimeter around what you want to protect. The ingredients in granular deer repellents (with a few exceptions) are designed to activate the natural “flight response” in deer. They will smell the granular and fear for their lives because they sense that a predator is in the area! Active ingredients in granular-based products typically include dried blood, or coyote urine. Some of our favorite dry deer repellents are Deer Scram, Animal Stopper, Deer Off (spikes), Deer Ban, Shake Away, and Repels All (granular). Granular products are great for protecting large areas because you only have to use them as a perimeter. They are also perfect for protecting edibles and vegetable gardens, since they will not contact plants. Some dry repellents even work for up to 90 days because they are in a weather proof container! Some Final Points… We have heard that every product WORKS and that every product does NOT WORK. The important thing to get from this is that everything does work! These products have all been tested by the EPA and have been proven to work. The big thing is to determine what will work best for your particular situation… What is most appealing for you application-wise? Will you be able to keep up on the applications of the liquid products? Do you have potted plants that would be best to protect with a liquid? Or do you have a vegetable garden that you would prefer not to spray with an unappealing spray? These are all sorts of questions that you should consider before making your purchase. You may even want to switch up the products that you are using; use a granular in the spring when plants are growing fast and then switch over to a liquid in the summer when plants slow up. You may even want to consider using a combination of products so that if one wears out, you can rely on the other to back you up. These are all good options and it is just the matter of finding what will work best for you!